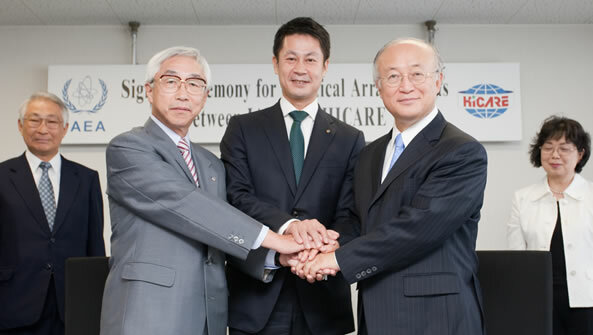 International Atomic Energy Agency (IAEA) and HICARE signed the Practical Arrangements in the context of fostering cooperation in the field of medical management, such as training and joint research, on August 6, 2010. 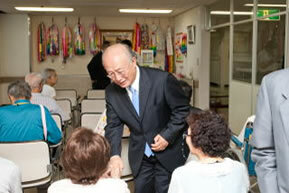 Mr. Yukiya Amano, the first Japanese Director General for the IAEA, visited Hiroshima on that day. After attending the Hiroshima Peace Memorial Ceremony, he visited HICARE member institutes; Radiation Effects Research Foundation, Hiroshima University Hospital, etc, and at Hiroshima Red Cross Hospital & Atomic-Bomb Survivors Hospital, he signed the Practical Arrangements with Dr. Hiroo Dohy, President of HICARE, with Mr. Hidehiko Yuzaki, Governor of Hiroshima Prefecture as one of the witnesses. HICARE expects that under this Practical Arrangements signed with IAEA, which is an international agency with 150 member countries, we will have the opportunity to promote our activities, enhance our role in the field of medical management of persons affected by radiation-exposure, and ultimately contribute to the world and facilitate international cooperation. Being desirous to contribute to international peace and stability, the IAEA and the HICARE will endeavour to implement cooperative activities in the areas identified on the chart bellow, including by jointly developing and/or conducting programmes in medical treatment of and research on persons affected by exposure to ionizing radiation. Joint Research ・Joint research in the field of medical management of radiation exposed individuals such as the effects of radiation exposure on humans. Enhancement of public awareness ・Organization of joint conferences, seminars and workshops. 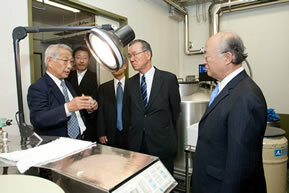 Information exchange ・Exchange of information and experience obtained by implementing the collaborative programmes. Go to complete version of "Practical Arrangements"
Since I assumed the office as Director General of the IAEA in December last year, I had had a strong wish to attend the Peace Ceremonies both in Hiroshima and Nagasaki. It gives me great pleasure and honour to be able to attend the ceremony today in Hiroshima, for the first time as Director General of the IAEA. Since this would be a great occasion, I had been considering how the IAEA could best contribute to the world, when the HICARE proposed to the IAEA to jointly implement cooperative activities in the area of medical management of radiation exposed individuals. I was pleased to sign today the Practical Arrangements between the IAEA and the HICARE which outlines areas of cooperation. Increasing numbers of countries express their interest in introducing nuclear energy and request various assistances from the IAEA. 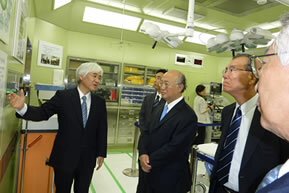 There are also growing needs for nuclear application for the medical purposes. In the event of possible exposure to ionizing radiation, a number of countries are yet to have national response in place to address such an event and lack the know-how in the medical management of radiation exposed individuals. Japan could contribute to the assistance to these countries with its long-experience in this area. Today I had an opportunity to visit the Radiation Effects Research Foundation (RERF) and Hiroshima University, and was deeply impressed with works and researches conducted there for long time, uninterruptedly since the end of the World War ?. City of Hiroshima is widely known to the world. Through implementing the Practical Arrangements we signed today, I sincerely hope that Hiroshima's experience could be shared for the benefit of the world. I also expect that with the signing of the Arrangements the cooperation between Hiroshima, in particular HICARE and the IAEA could further progress.